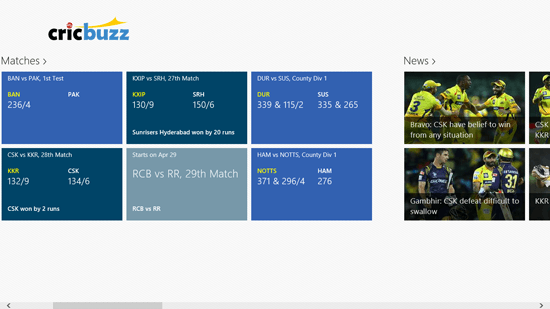 Get latest updates from the world of cricket with this cricket news app, Cricbuzz on your Windows 8 and 8.1. The app is free to be downloaded on your desktop, it has really great features which make it an amazing cricket news app. This cricket news app is really good for everyone who loves cricket and wants to be updated with every match played across the globe with different countries and clubs. From the left side of the cricket news app, you can choose the team you follow. There are different sections in the app for matches, news, editorial, schedule, photos and results. All the details on the app’s dashboard are displayed in the form of big tiles. In matches section, the information about the recently played matches or on-going matches are displayed with the team names, score and who won if the game has ended. In the news section, the news about different crickets updates are shown with the image, title and snippet on the tile. 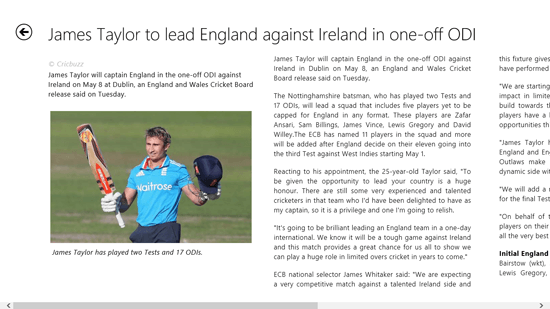 The editorial section also shows cricket news. Under the schedule section, you can browse the upcoming matches to be played among different countries and clubs. The information for these matches include venue, countries or clubs that will play the match, day and time of it. In photos, you can browse the photos captured and featured for the match that was played recently. The results show the final results of each game played lately. The user-interface of the cricket news app is not at all complex, it has been designed and organized in the most simple manner possible. The categories or the sections have headings on the top clearly saying what the section stands for. All the information under them is shown in the form of tiles like the native Windows layout.